Councillors are entitled to claim for expenses incurred while carrying out their roles for East Renfrewshire Council. East Renfrewshire’s councillors racked-up more than £12,000 in expenses claims last year. Reimbursements were given to existing and former elected members for meals, training and travel. 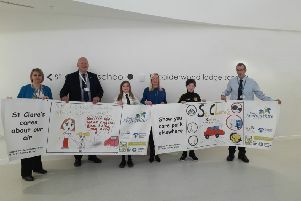 The largest amount, £2880, was attributed to Provost Jim Fletcher, although £2609 was for use of the civic car, which was paid for directly by the local authority to BMW. Council leader Tony Buchanan claimed £1553 while Conservative Barbara Grant got back £2131, with both councillors having been reimbursed £996 for two COSLA conferences dating back to 2016. Alan Lafferty, the Convener for Environment was the only other councillor to claim back more than £1000, with £498 paid for training and conferences and £530 for telephone and ICT expenses. Barbara Grant said: “There were two COSLA conferences that I attended. It’s not just one day, it’s two nights. One of those conferences took place in the previous year but they didn’t have it included in that year’s expenses. The total amount of expenses listed came to £12,175. Although attributed to members, East Renfrewshire Council paid companies directly for mobile phones, broadband, taxi costs and attendance at civic functions. That meant the elected members didn’t receive any cash back for these expenses. The highest amount for phones and ICT services was Independent David Macdonald, whose total was £718. Conservative Jim McLean had the lowest amount claimed of any current councillor, with £13 all related for phone and ICT expenses. A number of former councillors were also listed. That group had a total expenses claim of £713 until they stopped working at the council. Former Convener for Environment, Vincent Waters, claimed £244 and had the highest expenses of the ex-councillors. Ian McAlpine, the ex-Convener for Corporate Services spent £159 on phone and ICT, while Mary Montague had £108 for her phone and ICT and £9 for other travel expenses. An East Renfrewshire Council spokesman said: “Councillors are entitled to claim for expenses incurred whilst carrying out official duties as part of their role.